Svätý Jur, the smallest of five important western Slovak viticultural centres, is situated close to Bratislava. It was settled from an early date and traces of the oldest settlements date back to the 4th millennium BCE. By the 9th and 10th centuries a large Slavic fortified settlement stood at a location called Neštich covering an area of more than three hectares. The early Gothic Biely Kameň Castle, the seat of the Counts of Svätý Jur, was built in the 13th century in the neighbourhood of this Slavic settlement. Svätý Jur was first mentioned in 1209 when the king dedicated it to the ancestor of Svätojurský named Šebeš. From that date the town was held by the Svätojurský family and in the mid 14th century the king granted it the right to hold fairs. The Gothic Church of St George, standing in a dominant position above the historic fortified town core in the former independent part called Neštich, ranks as one of the best-preserved architectonic features of the town. Viticulture along with developing crafts and other rights and privileges were the impetus for the rapid economic growth of the town. Thanks to those rights and privileges it managed to free itself from the rule of landlords, becoming a free royal town in 1647. Today’s partially-preserved town fortifications that originally encircled the triangle historic core of the town date back to 1603 and 1647. The fortifications were built in order to increase the striking power of the country against Ottoman raids. Viticulture is also reflected in town architecture. Viticultural houses are characterised by tall gates with passages and vaulted cellars, and originate mostly from 17th to 19th centuries. The 18th and 19th centuries were a period of stagnation and during this period the town lost its privileges and status. 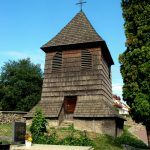 The original early Gothic Roman Catholic parish Church of St George, dating from the 13th century, and the nearby wooden belfry, belong to the most important monuments of the town. The Holy Trinity Church from the 17th century, the Evangelical Church from the 18th century, and the reconstructed Piarist Monastery from the 17th century, complete the list of sacral monuments in Svätý Jur. 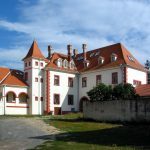 Prominent amongst the town’s secular monuments is the two-storey Pálffy Mansion with its inner courtyard, dating from the 17th century. 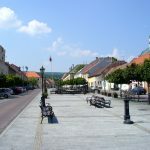 Svätý Jur has successfully preserved its character of a Little Carpathians viticultural town enclosed by cultivated country. Its core, established as a Town Conservation Reservation in 1990, was renovated in 2001.